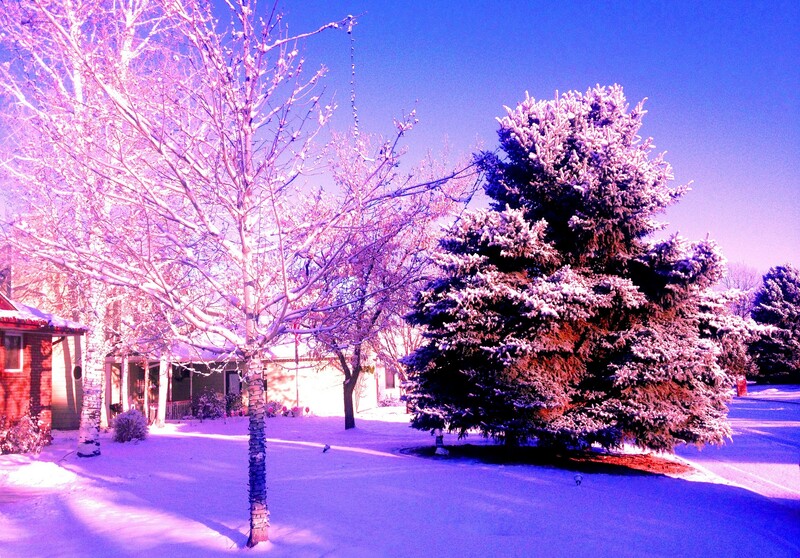 What a scene to wake up to in this special and festive time of year; fresh unexpected snow on the ground for my visit to family in Greeley, Colorado. Wishing all of you a wonderful Holiday Season with your family and friends. With some reflective opportunity, let’s look at the events that shaped the Chickasaw Visitor during this time of year. Last Post we viewed the detailed events of the Visioning/Programming phase that sets the stage for everything that follows beginning with the next phase in the project, “design.” As the project moves forward, the activities evolve into the tasks of Schematic Design. The floor plan is solidifying, structural grids being laid out, engineering systems selections and design concepts are being finalized. Let’s see what the team was up to this season in 2011. Here’s a detailed activity log. 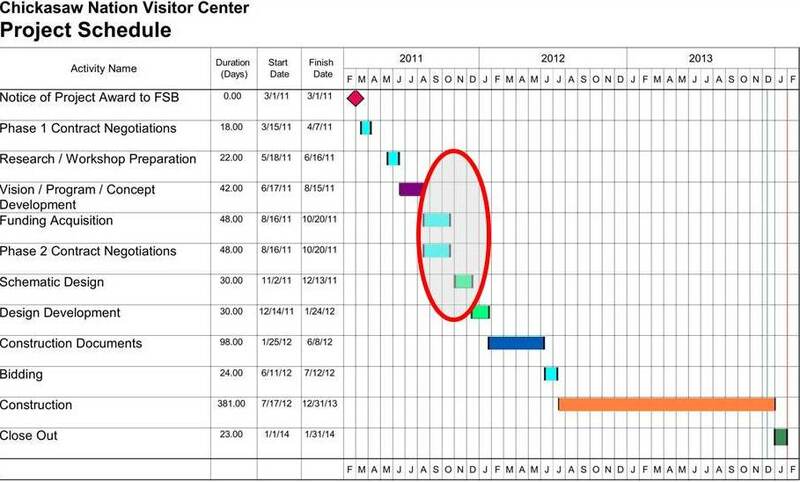 Here’s a detailed story of the as seen through the activity log for project kick-off and schematic design. August 15; on the heels of approval of the Visioning/Programming effort, we initiate contract negotiations for Basic Services (schematic design, design development, construction documents bidding and construction services). August 21; supplier is putting together a stone mock-up to verify our stone selection for the project. August 28; draft of Owner-Architect agreement is ready. October 20; FSB receives fully signed Owner-Architect agreement for Basic Services. October 24; FSB multi-discipline project team is being assembled. October 25; Request for Proposals is sent out for geotechnical services (site borings to subsurface conditions and soil bearing capacities for structural foundation design. October 28; FSB IS department is setting up the Revit model so the team can be ready to build an electronic model of the Visitor Center in the computers for eventual creation of electronic documents. October 31; FSB receives proposals for geotechnical services. October 31; investigating the possibility of using geothermal system for heating cooling system for the project which would count towards LEED credit. November 1; geothermal system ruled out due to site not having enough open area to incorporate wells. November 2; Revit model is set up and ready for team to use. November 2; researching the application of photovoltaic power generation system; 10 kilowatts needed which equates to 170-200 square feet of photovoltaic panels. November 7; FSB selects geotechnical servicers firm to begin subsurface exploration. November 10; Received site survey from the Chickasaw Nation which contains; topography, property lines, easements, utilities and surface features. November 18; LEED analysis is initiated. November 22; FSB team progress meeting. November 23; FSB receives preliminary site boring information from geotech firm. November 27; research progressing on engineering systems and schematic design descriptive text. November 30; FSB gets confirmation that we can obtain the Public Transportation LEED credit for our location in Sulphur, Oklahoma (this was touch and go as Sulphur is not a large urban environment). December 1; Drafts of engineering descriptive texts are ready. December 2; Discipline coordination meeting with plan updates reviewed. December 2; Schematic Design books shipped to the Chickasaw Nation (owner). December 5; Initiating project cost estimate. December 6; Chickasaw Nation notifies FSB that they are in the process of adopting the 2009 International Building Code. December 7; site grading plan establishes the finish floor elevation as 998.5 feet. December 7; current floor plan is sent to the Chickasaw Nation for coordination with their IT. December 12; FSB receives fire hydrant flow test data for the design of the fire protection sprinkler system for the Visitor Center. December 12; FSB sends Schematic Design cost estimate to the Chickasaw Nation; the design contingency has been reduced from 10% to 9.75% to maintain the budget. We’ll pick up with the new year and design development activities in the next post. BLESSINGS TO YOU FRED & YOUR FAMILY. BEST REGARDS TO ALL AT FSB. MAY THE JOY & PEACE OF THE SEASON BE YOURS NOW & ALWAYS!! KEEP UP THE GOOD WORK, IT HAS BEEN A SOURCE OF INSPIRATION!! Henry. Thanks for your greetings. We wish you and yours a gracious holiday season and a wonderful new year. Thanks for following.